Chico MacMurtrie's "Hexagons" at the Bronx Museum of the Arts. Opening March 27th. Chico MacMurtrie/Amorphic Robot Works will present for the first time in New York his inflatable robotic installation Hexagons at the Bronx Museum of the Arts. Suspended from the ceiling and arranged in the form of a cluster or cloud formation, Hexagons is composed of six sets of urchin-shaped robotic muscles. Visitors are invited to experience Hexagons from a lying-down position, on the Hexabed, looking upward, in a state of relaxation. From this perspective, the slow movements and airflow through the Hexagons, like breathing, becomes a metaphor for the inner workings of our bodies and all life forms, a dance of nature infused with technology. Curated by Gerardo Mosquera, the exhibition Useless: Machines for Dreaming, Thinking and Seeing will feature a selection of curious machines created by artists with the goal of stirring dreams, feelings, critical thinking, and ironies; for seeing what microscopes, telescopes and cartographies cannot show; for flying without taking-off; in short, for doing the impossible. It has been a long tradition among philosophers and writers to praise uselessness as a means to stress the importance of spiritual activities and creations without clear functional aims. To praise inutility, thus, has been a reaction to the materialistic values promoted by capitalist society, which has been criticized for its lack of moral and spiritual values. Artists included in the show: Jairo Alfonso, Wim Delvoye, Juan Downey, Peter Fischli & David Weiss, Algis Griskevicius, Shih Chieh Huang, José Iraola, William Kentridge, Chico MacMurtrie, Stefana McClure, Arnaldo Morales, Roxy Paine, Fernando Sánchez Castillo, Shyu Ruey-Shiann, Adriana Salazar, Johanna Unzueta, and Simón Vega. Opening Reception, Wednesday, March 27th from 6 - 8 P.M.
B or D train to 167 St. Walk south two blocks. 4, B or D TRAINS to the 161 STREET/YANKEE STADIUM STATION. Walk east three blocks to the Grand Concourse, then, walk north four blocks along Grand Concourse to 165th St.
Pneuma Fountain by Chico MacMurtrie/ARW. Photo: Shawnee Hicks. ZHI Art Museum is pleased to present the exhibition Open, curated by Zhang GA, and co-presented by the Chronus Art Center, Shanghai, celebrating the long-awaited official inauguration of the museum. The exhibition brings to the public a highly idiosyncratic body of work by nine international artists: ZHANG Peili, Marnix De Nijs, Michael Joaquin Grey, Lawrence Malstaf, WANG Gongxing, Carsten Nicolai, WANG Yuyang and Chico MacMurtrie/Amorphic Robot Works. Their work accentuate the concept "open" as a form of initiation, a movement in which a new start gathers force and an unfolding which unleashes the force of potentiality. 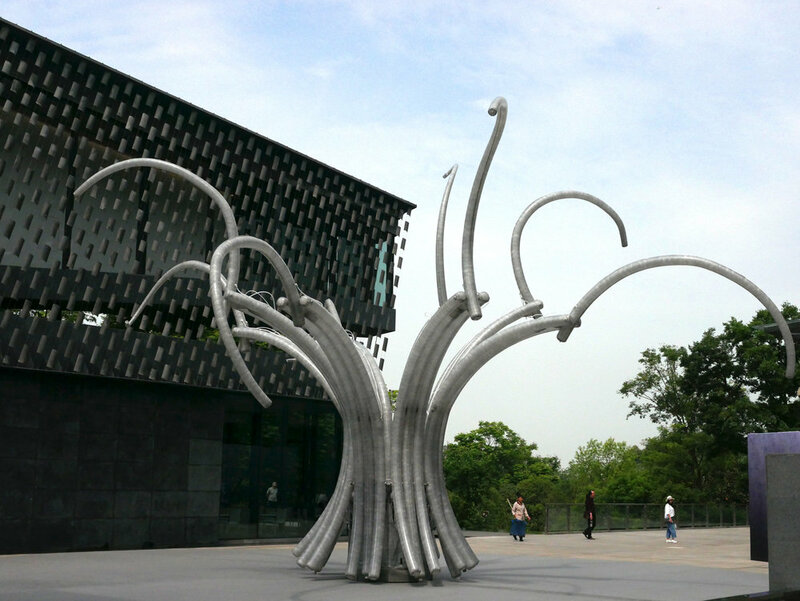 It evokes opening as an event that gets off the ground the pioneering undertaking ZHI museum aspires to accomplish. Pneuma Fountain is Chico MacMurtrie/Amorphic Robot Works’ most recent inflatable robotic sculpture depicting organic transformation and movement at a monumental scale. Radiating from the center of the terrace prior to entering the museum, Pneuma Fountain consists of 8 translucent 4-meter-tall fabric arches that spring to life and change shape as they fill with air, rising up to the sky and curving back down again. They evoke streams of water in slow motion as they form an ephemeral circle 16 meters in diameter, emanating from a cylinder that houses the technological brain which uses software to interpolate and map the spatial coordinates and velocity of the sculpture’s movements. As the arches gradually release air, their crisp architectural forms yield to seemingly chaotic coils and other configurations that reflect their built-in kinetic “memory” and suggest another, more organic order. Pneuma Fountain’s continuous metamorphosis is designed to engage and transform the space around it. The work manifestly captures and anticipates the unfolding theme of open as a contemplative experience of movement, air, light and architecture.